I went to Nara, a smaller city south of Kyōto. There is a lot of history in Nara. It was Japan's capital from 710 to 794. A set of eight temples, shrines, and ruins form a UNESCO World Heritage Site. One of these is Tōdai-ji, a Buddhist temple complex that houses the world's largest bronze Buddha statue in the world's largest wooden building. I wanted to see that plus the other World Heritage Site locations, but I also wanted to see the kofun in and around Nara. 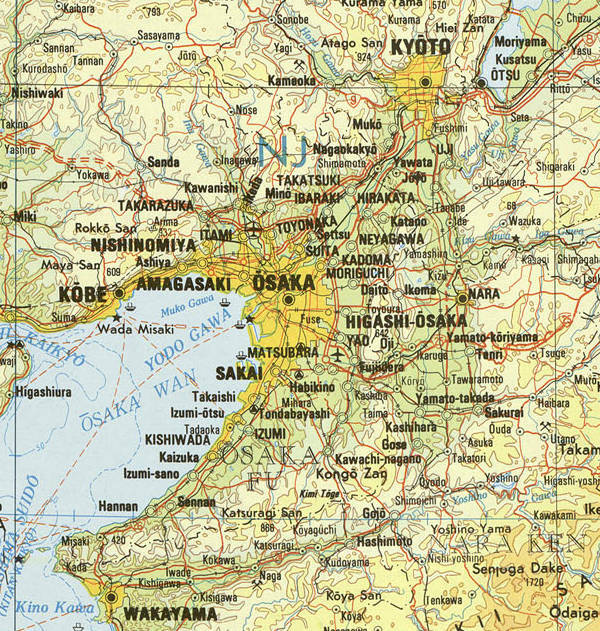 I stayed in Nara for a few nights and took a day trip south to Asuka, which you can also see on the map below. In this series of pages — Great Buddha of Tōdai-ji, the world's largest wooden building, gigantic megalithic tombs, sacred deer, heavy metal poisoning, prehistoric heroes, Emperors as deities, the arrival of Buddhism in Japan, and more. Map NI-53 from the University of Texas' Perry-Castañeda Map Collection. A kofun is a large ancient tomb structure in Japan. They range in size from big to huge, and they're mysterious. They date from a time of myth, before recorded history. Tombs of chieftains in the Yayoi period of about 300 BCE to the mid 200s CE were mostly square mounds surrounded by ditches. 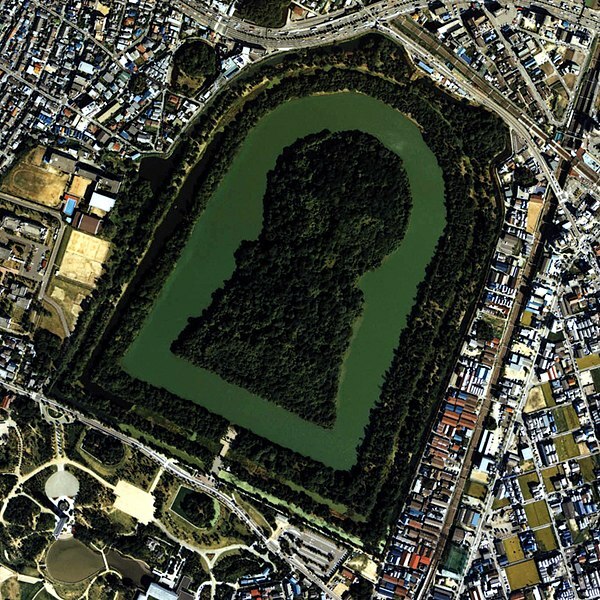 The keyhole-shaped kofun date back to the period from the early 200s CE to the early 600s. These were still prehistoric times in Japan as there was no written language in which to record events. Buddhism didn't officially arrive until 552, after some visits by Buddhist monks starting in the 400s. Buddhism brought Chinese characters and, less usefully, Sanskrit, but the limited reading and writing was mostly for religious purposes. Each kofun contains a megalithic passage grave at its core. It is covered in a large earth mound possibly over 400 meters long by 300 meters wide, surrounded by a moat. They are believed to be the tombs of early Emperors, although much of the "history" of the period is actually legend and myth. Because the Emperors are believed to be descendants of the gods, most kofun are off-limits to almost all scientific examination. * Some have been scanned with foliage-penetrating LIDAR to capture 3-D models, but that's about it. * Yes, Emperor Hirohito renounced his claim of divine descent after World War II, sort of, but his wording was nuanced and did not translate well into English. My page attempting to explain State Shintō has more on this. The picture above is an aerial photograph of Daisen-kofun in Sakai, Ōsaka, the largest kofun in Japan. The key-hole shaped area is 486 meters long, it's 305 meters wide across the bottom edge, and the circular area at top is 245 meters wide. This is an example of the classic keyhole shape, called zenpō-kōen-fun. Only a few kofun have been investigated. The megalithic passage tomb is beneath the center of the circular part. It is built from stones two to four meters in size. A narrow passage leads to a roughly rectangular main chamber. The megalithic tomb is buried under a circular mound of earth. Some kofun clearly have multiple tiers, others either didn't have multiple levels or have eroded to a smooth profile over the centuries. A roughly rectangular extension is added, usually tapering outward as seen above. It usually is lower than the circular mound. If we call the circular end the "top", then the "bottom" is roughly rectangular or, as in the above example, tapers outward. The keyhole shape is surrounded by a water-filled moat that is semicircular at the top end and rectangular below that. Just enough kofun are aligned with the top end pointing roughly north to make you think that's the standard. Then you run into one that is 90° or more off. The Great Pyramid of Giza is 230 meters wide at its base. Daisen-kofun has room for two identical pyramids, side by side. Daisen-kofun is only 35 meters tall, versus 139 meters for the Great Pyramid of Giza, and the Great Pyramid of Cholula has them both beat for volume and area on the ground (400×400 meters), but still, Daisen-kofun is huge. In this and the following pages I refer to the circular area as the top and the straight edge at the opposite end as the bottom, agreeing with the roughly alignment in this and most overhead photographs. The Japanese terms seem to be "rear" and "front", respectively, based on Google automated translation of Japanese Wikipedia pages. 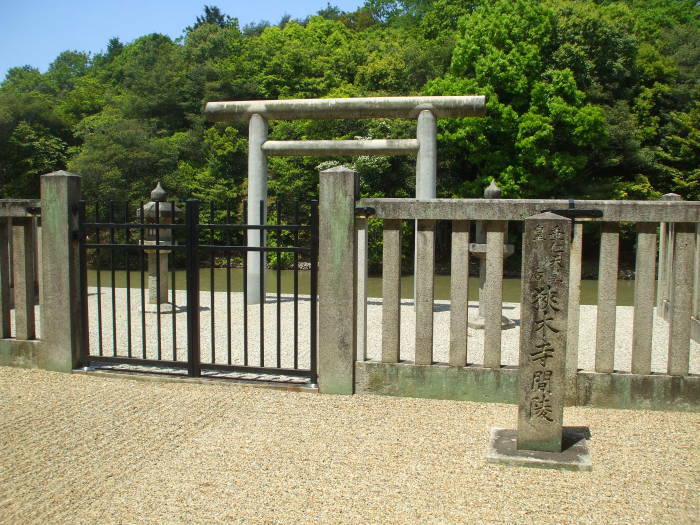 The place to visit, to pay respects, or to worship, depending on your interpretation of the concepts of Shintō and your personal reasons for visiting, is at the center bottom outer bank of the moat. The example above is surrounded by trees all around the outer bank of the moat except for a light colored area at the memorial shrine. As with much of Shintō, I don't know how to interpret the placement of the torii in these cases. But I assume that it's something along the lines of the torii indicating a place where you would pass into more sacred space if you were able or were allowed to intrude into the deified Emperor's mausoleum. Which, of course, you aren't. What we will see is that the official party line is that many kofun are tombs of the Emperors, who are descendants of the gods, and others are believed to be tombs of Empresses who functioned as regents, ruling on behalf of a young Crown Prince. Or, in a few cases, actually ruling as Empress, the monarch. Some of the supposedly interred Emperors are pretty obviously nothing but legend. Even if they existed, their lifespans don't necessarily align with kofun construction dates. The Imperial Household Agency says that the kofun of Emperors and their families and consorts are sacred religious sites, they are sanctuaries housing the spirits of the Imperial family and their ancestors. There are 848 Imperial tombs in Japan, 123 of them for Emperors. Shintō says that a kami or spirit can be moved from one dwelling to another. So, the Imperial House has felt free to change its mind about just which Emperor's spirit, legendary or not, is housed in a given kofun. An Asahi Shinbum article from March 2008 (original Japanese article here) says that an academic call for an end to the ban on scientific examination of burial mounds grew louder after 1965. That was when Koichi Mori, now a professor emeritus at Doshisha University, published Kofun no Hakkutsu or Excavating Kofun. That book looked at the Imperial Household Agency's designations of burial mounds and listed many discrepancies between years of kofun construction and deaths of Emperors. Ten archaeological societies released a joint statement in 1976 asking the agency to open Imperial mausoleums for study. The agency allowed representatives of those groups to observe repair work done in 1979 by Imperial Household Agency staff. The Imperial Household Agency continues to come up with reasons why scientific examination is impossible. "Safety" is cited — you would have to cross the moat and the only available boat is "too old". The problem is that any scientific examination is likely to contradict the claims of which Emperor is "enshrined" in a given kofun. It might indicate that the occupant was not a ruler. Many of the early monarchs listed as Emperors of Japan were entirely legendary. Those who really existed were tribal chieftains controlling a small region centered on Yamato, around today's Nara Prefecture. Or, perhaps worst of all for the Imperial cult, it might show that the Imperial House of Japan is descended not from the gods, but from tribal leaders who came from Korea. Paleolithic man used objects found in nature and simple handmade tools. Stone tools were produced by chipping or knapping. Society was bands of no more than about 100 people living in caves and other natural shelters, sometimes in huts made from skins of large animals. Mesolithic technology added composite tools: the harpoon, the bow and arrow. Short-term villages appeared. Neolithic technology added stone grinding and polishing. That produced more sophisticated tools like chisels, hoes, plows, and other farming implements. Some plants and animals were now domesticated. There were also looms and simple pottery. Now there were permanent settlements ranging in size up to walled cities. By the end of this period some of those cities housed chiefdoms controlling surrounding territory. The Bronze Age developed the first metal tools. First from copper (Chalcolithic), then from bronze, the result of alloying copper with tin, arsenic, or other metals. Tools and society developed further. The Iron Age brought tools made from that metal, with countries and empires whose cities were connected by networks of roads. But... that sequence only describes the cultures those British historians were researching in Europe, around the Mediterranean, and in the Near East. It doesn't really describe the history of Africa, Asia east of the Levant, or the Americas. Several researchers argue that it doesn't really describe the sequences those researchers were looking at! Civilizations weren't synchronized, even with their neighbors. The result is that one civilization might develop some technology before anyone else, but lag behind in another area. So What Was the Sequence in Japan? Humans first arrived in Japan around 38,000 BCE. The sea level may have been as much as 100 meters lower, but it still required a significant open-water crossing. By about 35,000 BCE they were producing and using ground and polished stone tools. That was unusually early! The European-centric 3-layer Stone Age model says that doesn't happen for another 20,000 years and marks the beginning of the Neolithic. So, for stone tool technology, Japan was 20,000 years ahead of most of the world. There had been a long assumption that no humans were in Japan before about 14,000 BCE, traditionally defined as the start of the Jōmon period. Periodic large volcanic eruptions have covered the archipelago of Japan with levels of ash that are easily dated. Scientists stopped excavations when they reached the depth corresponding to about 14,000 BCE. They only went deeper and discovered earlier artifacts in the late 1940s. Ground and polished stone tools have been found at depths dating back to 35,000-30,000 BCE. A few sites have been tentatively dated back to 40,000 to 50,000 BCE, but scientists remain very cautious. The Mainichi Shimbun newspaper discovered a hoax in 2000. Shinichi Fujimura, an amateur researcher, had become close to professional archaeologists in the early 1970s. Through the 1970s and 1980s he appeared to have phenomenal success discovering artifacts from the oldest stone-tool-based times. The national government designated some of his dig sites as national historical sites, and the national Agency for Cultural Affairs sponsored special exhibitions. In 2000 a newspaper published an investigation in which they showed that he had been planting Jōmon period artifacts from 14,000 BCE and more recent, and then "discovering" them the following day at greater depths corresponding to 40,000 BCE or earlier. Since then, apparent Paleolithic or pre-Jōmon discoveries are treated very cautiously. The pottery of the Kofun period is of two categories, haji and sue. Haji ware is the local form of pottery. It evolved out of the preceding Yayoi pottery technology, and specialists disagree on the precise distinctions between late Yayoi and early Haji pieces. Haji ware is utilitarian, of reddish-yellow color and fired at relatively low temperatures. It is commonly found in cooking areas or in trash middens. Sue ware is based on technology imported from Korea. It is grey and it was fired at high temperatures around 1200 °C. Sue ware was expensive, only the wealthy routinely used it. Most homes had at most one sue vessel used for household rituals. Both haji and sue ware varied by location and over time. Pieces from most regions of Japan can now be dated by their design with an accuracy approaching 50-year periods. Metal arrived late in Japan. The classic Bronze Age in the Near East lasted from 3300 BCE to 1200 BCE. China used bronze roughly 3000-700 BCE. Bronze use expanded to Korea and was its dominant technology roughly 1000-300 BCE. The Yayoi period, starting about 300 BCE, was the beginning of metalworking in Japan. Bronze arrived first, from China and Korea. Iron technology arrived during the late Yayoi period, traditionally dated as lasting from 300 BCE to 300 CE, or the early part of the slightly overlapping Kofun period that started about 250 CE. Bronze was used for ritual and ceremonial objects. and iron was for tools. 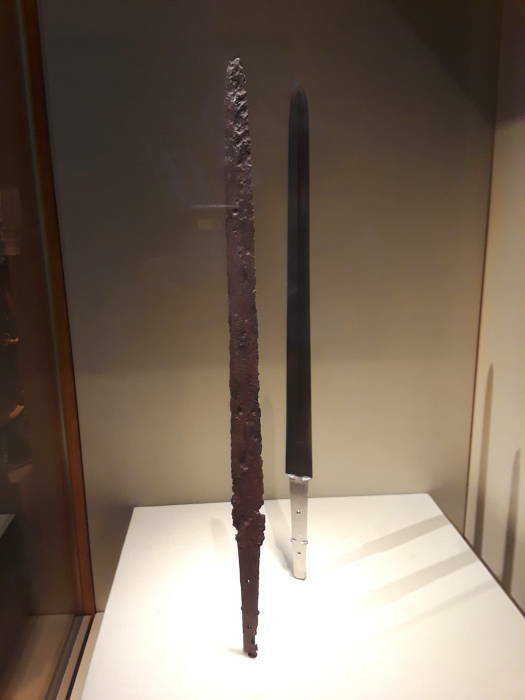 The ken, a sword with a straight double-edged blade based on Chinese prototypes, was used in Japan from at least the third century until the sixth century. At the end of that period, the double-edged sword was gradually superceded by the single-edge type, from which all later Japanese swords developed. This ken was discovered in one of Japan's most famous early burial mounds, known as the Eda Funayama Kofun (burial mound), located in Kumamoto Prefecture, on Kyushu Island, in southern Japan. The mound, which was excavated first in 1873, yielded many rare items, including jewelry, crowns, ceremonial shoes, armor parts, mirrors, and several swords, all of very high quality. Swords of this period are extremely rare and show the earliest stage in the development of Japanese sword blades. This blade was given to the Metropolitan Museum of Art in 1906, as part of an exchange of art objects with the Imperial Museum in Tokyo that was arranged by Dr. Bashford Dean, who at the time was Honorary Curator of Arms and Armor in the Metropolitan Museum. In 1965, the remaining finds from the excavation were designated officially as National Treasures, the highest ranking given to cultural objects in Japan. They are now in the collection of the Tokyo National Museum. This blade was commissioned by the Department of Arms and Armor to give a vivid sense of the original condition and beauty of the extremely rare and important fifth century ken (acc. no. 06.310.8) shown next to it. 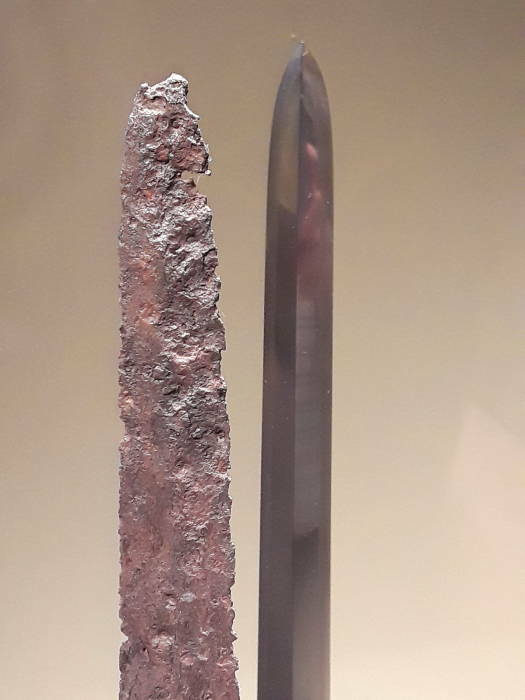 Mr Miyairi, an award-winning Japanese swordsmith, spent three years creating this replica, which allows us to see and appreciate details, such as the complex tempering (hamon) and forging patterns (jigane), now obscured in the original blade due to its archaeological condition. Ceremonial complexes in today's eastern Turkey date back to 10,000 BCE. They were built from megaliths, literally "large stones" assembled into structures without mortar. Megalithic tombs and other structures were built across northwestern Europe, across today's France and Britain, from roughly 4500 to 1500 BCE. Some of these were passage tombs, a narrow passage leading to a roughly rectangular chamber. The Roman Empire spread its culture and recorded local history through that same region starting around 50 BCE. The local people retained the Latin language long after the Roman administration had ended. Japan didn't start building the megalithic kofun tombs until the 200s CE, and they continued into the early 600s. This was about two millennia after similar megalithic structures were last built across Normandy and Britain. 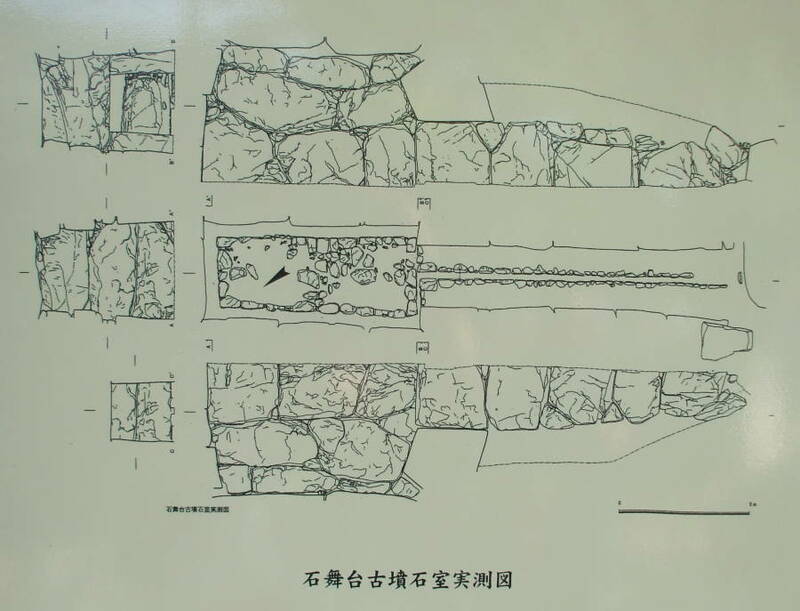 Below are side, overhead, and end view drawings of the megalithic passage grave at Ishibutai kofun near Asuka, Japan. The passage is the long, narrow area to the right in these drawings. The tomb chamber is the larger, roughly rectangular area to the left in the side and overhead views. This kofun was believed to belong to a specific man, a member of a powerful clan. His daughters married members of the Imperial family, but he was not otherwise related to the Imperial family. The Imperial house allowed scientific examinations, starting in 1933. "Rites and Rituals of the Kofun Period"
Japan didn't have a written language, so they weren't recording their own history. A few historical reports of Japan were recorded in Korea and China, but they were vague. 5th century Chinese records tell of regular visits from emissaries from "the mysterious five kings of Wa", as China referred to Japan. Before that, Chinese chronicles told of the "Wa Unrest" around 190 CE. At the end of it, Himiko (or Pimiko), the priestess and ruler of the petty kingdom of Yamatai, assumed overall leadership of Wa. In 239, as the monarch of Wa, she opened diplomatic relations with the Wei court in China. This was the period when the first keyhole-shaped tombs were built in Japan. She does not appear among the legendary early Imperial rulers of Japan. The historical works Wei Zhi and Hou Han Shu, describing events in China in 194, reports a great and long-lasting famine, the result of unusual weather patterns, and "people ate other people". This was a Little Ice Age, when famine spread throughout East Asia. The people joined their leaders in praying for the aid of the kami, the local spirits. In Korea they practiced regicide when the prayers of the community were unanswered. In Japan, the Yayoi period kami had failed the people. It was time to banish them, by destroying the bronze ritual objects and discarding them in rivers or tombs. Himiko aquired "an exquisite gift" of 100 bronze mirrors from the Wei court in China in 239. There were further "little Ice Age" events, including one in 536-537 and another in 540-542 ["Twilight of the gods? The 'dust veil event' of AD 536 in critical perspective", Antiquity, v86 n332, June 2012, pp 428-443, doi.org: 10.1017/S0003598X00062852]. Buddhism brought written language to Japan when it arrived from Korea in 552 CE. Writing arrived in a complicated form, as the Buddhist scriptures were originally written in Sanskrit. China had translated and adapted the original scriptures using their native writing system. This was what arrived in Japan — writing in Chinese representing Sanskrit. The Kofun period might be described as Japan's protohistoric period. Before this, no history was recorded, it was prehistoric. Forms of writing began to arrive in Japan during the Kofun period. Also, there was interaction with literate cultures in Korea and China, where they recorded some facts about their neighbors. When the historic records that survive to today first began appearing in Japan, they recorded some older documents that have been destroyed and oral traditions of recent centuries. The katakana and hiragana scripts are highly modified Chinese glyphs representing syllables, traditionally organized in Sanskrit phonetic order. Japanese is written in a combination of Chinese kanji when a sign is available and known, with hiragana to explain kanji and phonetically spell Japanese words as needed, and katakana to phonetically spell words of foreign origin. It's an enormously complicated and confusing system, but at least Japan had a writing system now. In the early 700s the Emperor commissioned the writing of two compilations of Imperial genealogical legends and what was believed then about the creation of the universe, which meant the Japanese archipelago. Up to that time these legends were native lore passed along in oral form. The first of these documents was the Kojiki (or Records of Ancient Matters), written down in 711-712 CE, and the second was the Nihon Shoki (or Chronicles of Japan), written down about 720 CE. They're referred to as "histories", although they're really compilations of legends. The word Shintō or "Way of the Kami" was adopted then to describe the spiritual folk tradition. It is also called Kami-no-michi or the "way of the divine" or "way of the gods", Kannagara-no-michi or the "way of the divine transmitted from time immemorial", Kodo or the "ancient way", Daido or the "great way", and Teido or the "imperial way". The idea of the divine ancestry of the Emperor comes from Shintō. Unlike the corresponding Chinese writings, the Japanese chronicles begin before the creation of the world. They maintain an entirely mythological view throughout their description of the early godlike and later heroic human figures. They connect the origin of the Imperial line with the deities before the creation of the world. The mythic Emperor Jimmu was described as a child of the creator gods, with the genealogy placing him maybe around 600 BCE. The two documents listed Emperors from Jimmu to within a few decades of when they were written down. Isn't it Weird to Deify a National Leader? If a deified Emperor seems a bit extreme, consider the fresco in the dome of the United States Capitol Building. The Apotheosis of Washington depicts George Washington ascending and becoming a god. The word αποθέωσις literally means to deify, to make someone into a god. It's just like the claims of Philip II of Macedon and his son Alexander the Great. Washington is surrounded in the fresco by Roman deities and mid-1800s technology — the goddess Minerva with an electrical generator and batteries, the goddess Venus helping to lay the transatlantic telegraph cable with an ironclad warship in the background, the god Vulcan with a cannon and steam engine, the goddess Ceres sitting on a McCormick mechanical reaper, and so on. It's a very weird mash-up of classical mythology, steam-powered technology, and American creation myth. I wouldn't want to try to explain the theological meaning to a foreign visitor. That was probably more background than you expected. Let's go to Nara! There are two train stations in Nara, one for the national Japan Railways and one for the private Kintetsu line. I stayed at the Hiloki Hostel, which is close to both. From the JR station just cross to the left across the plaza in front of the station, cross Sanjo Dori, and continue north along the street. 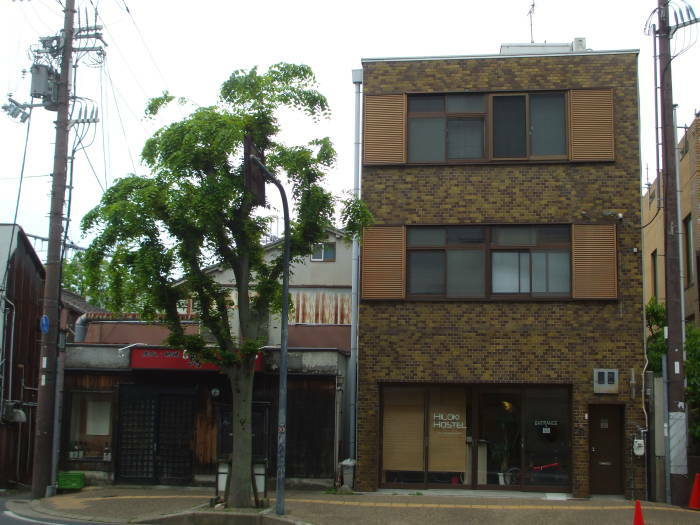 The Hiloki Hostel is a clean, well-lighted place with just one person on staff at a time. Plan ahead, as they're there only 0830-1130 and 1530-2030. A bed there was just ¥2,675 a night. And look at the map, the first kofun is nearby, the Mausoleum of Emperor Kaika! The sequence that "tells the story" to me is to work through the various sites in the order I visited them. There was a lot to see in Nara, so maybe start there. But follow whichever path you choose. The above is specific to Nara and the kofun. Or maybe you want to explore other places in Japan.